Everything went well. I had little or no trouble until the last 3-5 miles. My right shin (anterior tibialis) was very sore. I was able to run-walk up until this point. I think the last 3 miles in from Lake Henry took about 2 hours. I should have finished at 26 hours but managed to eeek out a run across the line at 27:29. I am very pleased with my time. 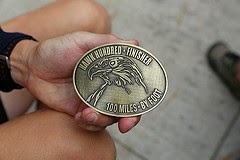 Next up, the Zion 100 in April with any luck.